Rev. Ken Downey, who has already ridden from Holly Beach, Louisiana, USA to Fort Francis, Ontario, Canada in 1999, is now riding across America to honor early pioneer Christian ministries. 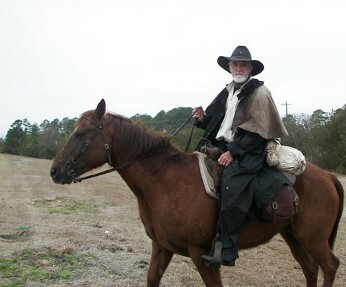 Ken is riding a quarter horse named Pilgrim, from the North Carolinas Atlantic coast to the state of Washington's Pacific coast. During his journey he will be ministering in the evenings at churches, homes and public places on the route, as well as engaging people along the trail. For more information, please visit Ken's website.